Following the publication of Martin Ford’s ‘The Rise of the Robots’ (FT & McKinsey Business Book of the Year 2015), much has been said by many commentators about the prospect of robotics and AI creating mass unemployment over the next few decades, often just regurgitating arguments in Ford’s book. 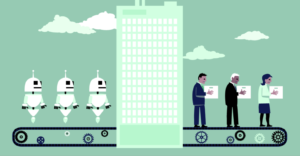 A new report from McKinsey Global Institute (MGI), entitled ‘A Future That Works: Automation, Employment And Productivity’, analyses the issue with more sophistication than most. Whereas other analyses have assessed which jobs could be automatable, MGI has taken the approach of assessing the likelihood of automation of around 2000 distinct work activities across 800 occupations, which then gives the proportion of each type of job that could be automated. This shows that very few (<5%) jobs can currently be automated entirely; others can be partially automated, with that worker’s role changing rather than disappearing. Rather than giving a single-line graph showing projected unemployment, MGI has published ‘early’ and ‘late’ scenarios for when work activity automation is adopted. Although this is less headline-grabbing than a confident-looking single line graph, it shows realism about forecasting that far ahead. MGI’s analysis shows 50% of worker time spent on current work activities being automated sometime between 2035 and 2070. Importantly, this is based on current work activities—new work activities that we can’t yet imagine will arise, potentially leading to higher employment than the current level (historically this has always happened as new technology replaced work activities); sensibly, the authors don’t try to guess at these new activities. Other points raised in the report include the declining size of the working population as a larger proportion of people reach retirement age, so we’re at greater risk of having a deficit of human labour than a surplus; the widespread adoption of automation of each activity will lag the capability to automate it by many years, due to a range of technical, economic and social factors; increased use of automation is inevitable and brings clear advantages to businesses but may be problematic to policy makers. The nature of work will certainly change radically over the next few decades, some entire occupations will disappear completely, but most roles will just change and a whole swathe of new occupations will appear (ten years ago who would have predicted the existence of, let alone the rise of, social media jobs?). Some industries (and countries) will be affected a lot more than others, and these are likely to prompt some highly alarming headlines, but overall it’s unlikely that mass unemployment will come about. Unless the singularity happens, in which case all bets are off. The MGI report can be downloaded here.